However campers travel, a reliable supply of electricity is now normal on campsites these days with mains hook-up common on pitches for tents and vehicles. 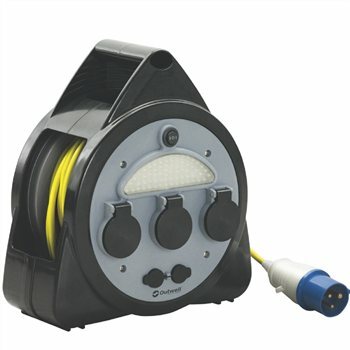 As safe electric power has become a key element in comfortable family camping, the Outwell range of mains kits has been developed with safety and reliability as clear priorities linked closely to convenience and versatility with long cables and built-in circuit breakers. Two USB ports 5V/2100mA for recharging Ipads, Ipods etc. Great power source for camping has USB also for all those tech families.Contains all the safety features you would expect.Most camps will not let you on if you don't have the RCD built in.The light also is bright. Ordering is easy and painless, tracking great and delivered on time. Product is exactly what I wanted.